This moth, which is active in the evening, is orange with black spots on all wings, sometimes with some white around the spots. It has a wingspan up to 4 cm across. The mature larvae to 4 cm long have alternating black and white stripes with some orange associated with the black stripes on the side of the body. The caterpillars pupate under litter. 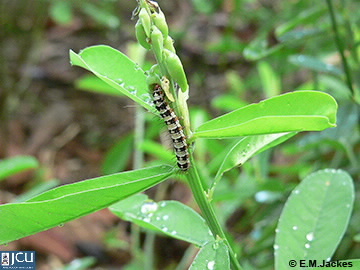 The plant being eaten in the photograph is Crotalaria retusa, (Wedge-leaf rattlepod), larvae eat both leaves and pods.